Eva Kor takes a picture with seniors Lauren Mottel and Sarah Jane Mee. Kor visited Padua on Nov. 19, 2018. 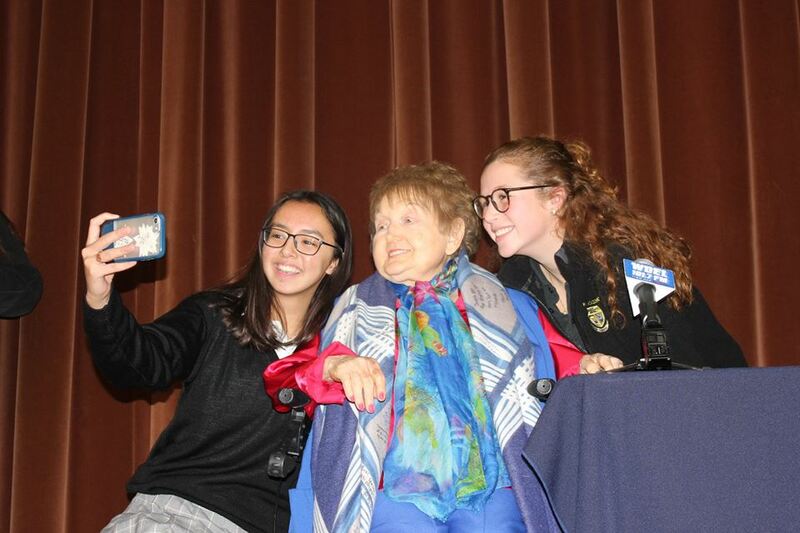 Eva Kor, Auschwitz survivor and advocate, visited Padua on Nov. 19, 2018. Kor and her sister Miriam were among the infamous Mengele twins: young children subjected to the dehumanizing and often deadly experiments conducted by Nazi Dr. Mengele. She had one objective: to walk out of the camp with her sister alive. Eva Kor has done more than just survive. She has since founded CANDLES Holocaust Museum & Education Center, continues to give lectures at age 85, and has publicly forgiven all Nazis. Kor’s message focused especially on the pain and isolation that young people can feel, and she urges students to heed her advice. And that she did—to an audience of over 600 Padua students, faculty and staff, and members of the press. Kor was born to a Jewish family in a small town in Transylvania in 1934. When Transylvania became part of Hungary, her family could no longer live in relative peace as the rights of Jewish people were gradually stripped away. She knew what was happening. “I have a theory,” she said, “that children as young as five years old… are a lot smarter than people think they are.” Her family thought the Germans would never come to a tiny village like theirs. 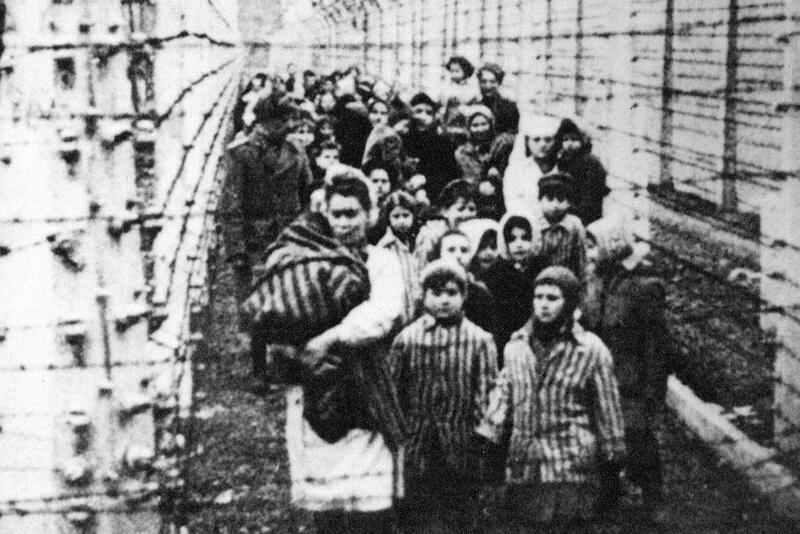 But at the age of 10, on March 15, 1944, she and her family were herded into a cattle car and told they were headed for a Hungarian labor camp. The final destination was not Hungary, however. The guards had lied—they crossed into German-controlled Poland, arriving eventually at the now infamous Auschwitz. The separation platform where new arrivals were sorted—gas chamber to the left and hard labor to the right—was chaotic. “It was the most crazy place I have ever been to,” said Kor. “People were crying, children looking for parents, parents looking for children, Nazis yelling orders, dogs barking—complete confusion.” A Nazi spotted Eva and Miriam, identifying them as twins and separating them from the crowd. Kor saw her mother’s arms outstretched as she was led to the left of the platform. She never saw her family again. She became A-7063, and her sister A-7064. The barracks in which they slept were “crawling with lice and rats.” But when Kor saw the bodies of three young children on the latrine floor, she knew that surviving would be a full-time job. The experiments that followed were cruel and inhumane. She grew ill due to the injections, and Dr. Mengele told her she had two weeks to live, which she spitefully defied. “I must survive, I must survive,” she told herself. Eva Kor, left, and her sister Miriam two days after liberation. Their liberation was filmed and used as Soviet propaganda. To this day, Kor does not know what she was injected with in what she called the “blood lab,” but the effects were devastating. Her sister’s kidneys were later determined to have never grown beyond the size of a 10-year-old’s. The war came to an end and both Eva and Miriam walked out of Auschwitz alive, returning to their home to find nothing but a few crumbling photographs. After time in school as a member of the Communist party, Kor moved to Israel where she met her husband, a survivor from Riga, Latvia living in Terre Haute, Indiana. She moved to Indiana with him in 1960, where she lives to this day. Miriam’s kidneys had failed by 1987. “I had two kidneys and one sister,” said Kor. “I had an easy choice.” Nevertheless, Miriam died in 1993 due to terminal health issues. The pain Kor felt was immense and overpowering. But when she forgave a Nazi doctor, Dr. Munch, her perspective on the world changed. Kor met with Dr. Munch at his home in Germany. Munch had worked at Auschwitz while she was there, and she later went with him to Auschwitz itself. She originally forgave him as gratitude for his efforts to make amends, but came to realize that her decision was primarily for her own healing. The next step was to forgive Dr. Mengele. But with forgiveness, Kor realized, came a freedom. She had the power to forgive, something her perpetrators could never control. 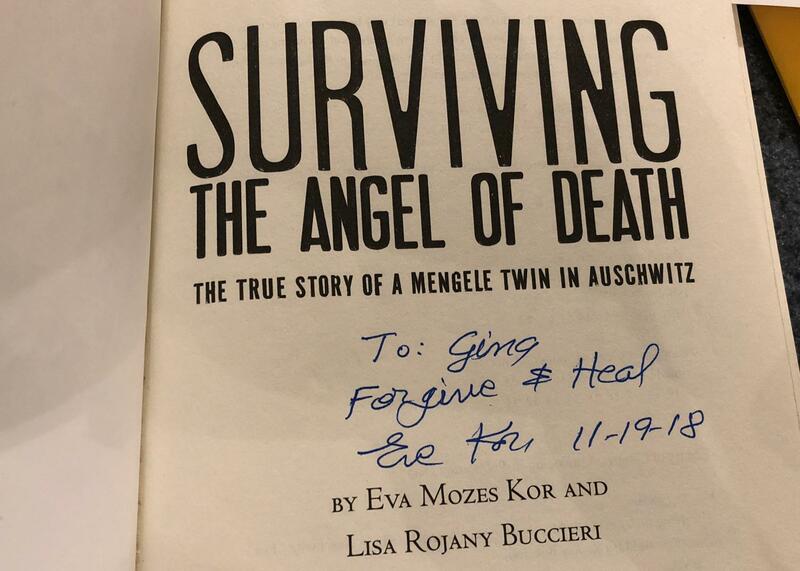 Inside each book Kor signed, she asked the student to “forgive and heal.” The messages of forgiveness and healing were central to her talk, urging students to consider the power of an unshakable will to carry on.